All rights reserved 1997 - 2019 Powersonic Computers. 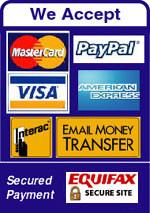 All prices in Canadian dollars.List price has reflected 3% discount of cash/interac payment. Product name and images are for identification purposes only and may differ from the actual product. Powersonic is not responsible for typographical or photographical errors.